You’ve seen it far too frequently—the dreaded forward shoulder posture. The causes of this characteristic posture are varied and it is a direct contributor to both shoulder and neck tension as well as movement dysfunction in activities of daily living, sport and occupation. To correct the forward shoulder posture—which in theory should improve shoulder function—we have been taught that we must strengthen our scapular retractors. In fact, this idea is so persuasive that I first learned of this in the very first rehab course I took in chiropractic college over 20 years ago. Today, I continue to have patients referred to my office who have been instructed by their trainers, therapists and/or internet gurus that they must do scapular retraction exercises to improve their forward shoulder position and improve shoulder stability. 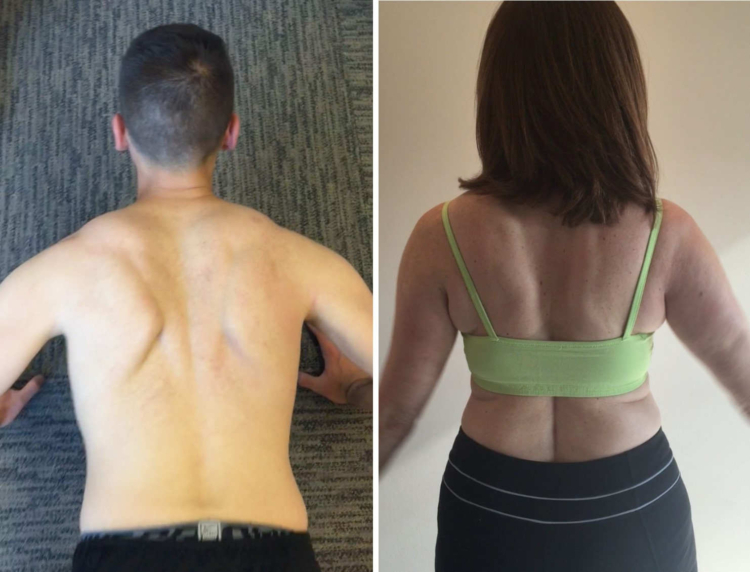 While this strategy may have short-term benefits, after evaluating hundreds of individuals with shoulder issues (in addition to experiencing my own shoulder problems following this advice), it has become evident that scapular retraction exercises rarely provide a long-term and sustainable solution to the forward shoulder posture. And unfortunately, we have seen individuals develop pronounced dysfunction in shoulder alignment and control by over-utilizing scapular retraction type exercises. In this article I am going to discuss optimal scapular mechanics and demonstrate how an over-reliance on scapular retraction exercises—including I, Y, T, W type exercises or simply over-adduction of the scapula during pulling exercises—can contribute to shoulder dysfunction. Additionally, I will share with you the one key thing you must do to improve shoulder function, as well as posture, in your clients with the forward shoulder posture. In an attempt to make it easy for the general population who are performing shoulder exercises, the rehabilitation and fitness industries have over-simplified shoulder mechanics. In the next section I will simplify, without over-simplifying, scapular alignment and mechanics. Then, I’ll discuss how to integrate these concepts into a corrective exercise strategy for improving shoulder alignment and control. The scapula should rest upon the thorax in slight upward rotation (where the inferior angle of the scapula is slightly more lateral or further away from midline as compared to the superior angle) and posterior tilt —a position where the inferior and anterior surfaces of the scapula gently hugs the posterior aspect of the rib cage (Sahrmann 2002, Osar 2015). Optimal scapular alignment and ultimately stabilization is also reliant upon a properly aligned and controlled thorax. Often postural and movement dysfunction of the shoulder can be directly related to loss of alignment and control of the thorax (Lee 2013, Osar 2016). Note that in neutral alignment of the scapula, the inferior angle (index finger of lower hand) of the scapula is slightly lateral to the superior angle of the scapula (index finger of upper hand) in the above image. The forward shoulder posture (FSP) is characterized by downward rotation and anterior tilt of the scapula (Osar 2016, 2012). This position is also commonly referred to as having a ‘winged scapula’ because the inferior and often times medial border of the scapula tends to lift away from the rib cage. While all muscles connecting to the clavicle, scapula, and humerus contribute to optimal scapular alignment and control, generally speaking the upper and lower trapezius contribute most to the upward rotation and posterior tilt position while the levator scapula, rhomboids and pectoralis minor contribute to downward rotation and anterior tilt. These muscles are summarized below in table 1. Two additional muscles, pectoralis major and latissimus dorsi, have a direct influence on scapular alignment and control even though they don’t directly attach upon the scapula. The pectoralis major—specifically the lower or costal fibers—insert into the humerus and exert an inferiorly-directed pull upon the shoulder complex. The latissimus dorsi also inserts into the humerus and similarly will pull the shoulder complex down and also can tilt the scapula anteriorly. Side note: the latissimus dorsi does have fibers that extend across the lower inferior angle of the scapula). Without optimal control from the upper and lower trapezius and serratus anterior, these two muscles will contribute to downward rotation and anterior tilt of the scapula. The scapula should remain in relative upward rotation and posterior throughout most static and dynamic activities. In individuals with FSP, there will often be a dominance of the muscles that downwardly rotate and anteriorly tilt the scapula including the lower fibers of pectoralis major and latissimus dorsi. See images below. The problem with downward rotation and anterior tilt of the scapula is not simply an aesthetics issue, as some experts may suggest. If the client begins in a downwardly rotated and anterior tilted position, but is able to correct this position with movement or loading of the upper extremity, we are generally not going to be over-concerned with trying to improve their static scapular positioning, i.e. their postural appearance. However, what most commonly occurs is that an individual’s postural alignment is snapshot or a reflection of their stabilization and movement strategy. Below are two examples of this concept. Note the client performing push-ups in the far left image. He presented with downward rotated and anteriorly tilted scapula bilaterally. Notice complete downward rotation of both his scapula—more significant on the left—at the bottom of the pattern. The scapula should be in relative upward rotation and posterior tilt even in the bottom position of a push up or while holding a plank pattern. In the image to the right, this client with impingement type symptoms also presented with downward rotation and overly adducted scapula. I am asking her to lift (abduct) her shoulders overhead. When the shoulder is abducting, the scapula should be moving into a slightly more abducted and upwardly rotated position. As this individual is lifting her arm, her scapula is adducting and downwardly rotating—the complete opposite mechanics from what should optimally be occurring at this point in lifting her arms away from her sides or when lowering her arms back to her sides from an overhead position. Both of these individuals have been instructed by their respective trainer and yoga instructor to “retract” and “pull their shoulder blades down and back” during many of their common exercise and movement patterns. These cues have impacted the motor control of their shoulders during their exercises as well as everyday activities. Retraction of the shoulder complex (which includes scapular adduction) is a normal part of biomechanics during the concentric phase of pulling exercises and the eccentric phase of pushing exercises. However over-retraction or consciously overusing the scapular adductors—primarily the rhomboids and middle fibers of the trapezius—can directly lead to altered mechanics during shoulder motion as noted above. Overuse of scapular retraction not only disrupts scapular mechanics, it rarely fixes the FSP because the individual is not altering the original issue that led to the forward shoulder in the first place, primarily downward rotation and anterior tilt. In fact, often times the individual is stabilizing their scapula into retraction in a downwardly rotated and anterior tilted position perpetuating tightness, impingement and discomfort. This alignment and altered motor control issue cannot be improved by ‘strengthening’ the scapular retractors or by performing more scapular retraction exercises as this will only perpetuate the current dysfunction and make it even harder to restore more optimal mechanics. I have seen this very common scenario in countless numbers of patients I have treated with shoulder impingement issues as well as experienced chronic dysfunction in my own shoulders from the years of having trainers and therapists encouraging me to work on ‘strengthening’ my scapular retractors and stretching my ‘tight’ pecs. Now that we have identified how non-optimal scapular alignment and control—especially downward rotation and anterior tilt—contributes and perpetuates the FSP and shoulder problems, we are now going to turn our attention to the corrective exercise strategy we use with our own clients. This is the same strategy I have used successfully to rehab my own shoulders and which has helped me avoid surgery related to torn labrums following years of exercising with faulty shoulder mechanics. What population do we look at that has optimal scapular alignment and mechanics? There is only one population that we can look at how they align and control their body and who generally haven’t been influenced by what they’ve been taught—they do what’s inherent or natural, what they look like—they aren’t compensating because of body image issues, or created compensatory patterns because of injuries, traumas, or surgeries. That population is children. Pavel Kolar et. al. have really brought to light how we are neurologically hard-wired to stabilize and move (2009). Child development—how each of us first developed stabilization and movement—served as our guideline for developing the principles of the Integrative Movement System which form the foundation of the Integrative Movement System Corrective Exercise Strategy. My niece demonstrates perfect alignment of her thoracopelvic cylinder (TPC) and shoulder complex. Notice that her scapulae are in upward rotation and posterior tilt and that she is not retracting or squeezing her scapula down-and-back while holding a plank position. As mentioned above, the principles of the Integrative Movement System—alignment, breathing and control —form the foundation of our corrective exercise strategy. Retraining optimal alignment and control of the scapula begins with aligning the TPC. The TPC must be optimally aligned to enable to concave anterior surface of the scapula to sit snugly upon the convex posterior surface of the thorax. Increased thoracic kyphosis causes the scapula to overly abduct and move into downward rotation. Increased thoracic extension (lordosis) or reversal of the thoracic kyphosis, which is the most common issue I see in active individuals with shoulder issues, disrupts the integrity of the scapulothoracic relationship because it flattens out the posterior aspect of the rib cage thereby compromising scapular alignment and ultimately control. Three-dimensional breathing recruits the primary muscles of respiration—the diaphragm, intercostals, pelvic floor and transversus abdominus—and decreases over-utilization of the levator scapula and pectoralis minor—the two most common accessory muscles of respiration that contribute to downward rotation and anterior tilt of the scapula. Three-dimensional breathing maintains alignment and mobility of the thorax thereby contributing to proper alignment of the thoracic spine and rib cage. This promotes optimal scapualothoracic alignment and control. Three-dimensional breathing regulates internal pressure within the thoracic and abdominal/pelvic cavities which helps to stabilize the TPC and in turn supports proper recruitment of the shoulder muscles. Wall Plank is one of our go-to patterns for improving alignment and control of both the TPC and shoulder complex. The position supports the scapula in upward rotation and posterior tilt and it is easy to work on TPC alignment and breathing in this position. This pattern is actually a pattern we use to teach many of our clients how to achieve more optimal upright posture. The client stands with his hands flat against the wall and his hands about ear level. His head and neck should be aligned over his TPC. This position should be relatively easy for the individual to maintain without experiencing any shoulder impingement or neck tension. If the client cannot achieve the Modified Wall Plank position without shoulder impingement or neck tension, release of the pectoralis minor, latissimus dorsi, levator scapula and/or lower fibers of pectoralis major can help achieve more optimal alignment without compression of the soft tissue. The individual should feel as if he is gently pulling the wall apart between his hands and elongating his spine from the back of his head towards the ceiling. He holds this position for five diaphragmatic breaths and relaxes. Generally, our clients will repeat for 3-5 sets of five breaths. I created this video demonstration of the Modified Wall Plank pattern several years ago for Fitness Education Seminars, however the main concepts discussed in the video are still relevant today. So what is the one simple key to improving the FSP? Understand scapular mechanics and be sure that all your corrective and progressive exercise patterns are reinforcing optimal alignment and control of the scapula in upward rotation and posterior tilt. The Modified Wall Plank is one of the key corrective exercise patterns we use with our clients however we always reinforce optimal alignment and control during each and every pushing and pulling pattern we have them perform. When in balance, the muscles of the scapular complex work synergistically to maintain the scapula in upward rotation and posterior tilt. The forward shoulder posture is a common posture created by an imbalance of the muscles that upwardly rotate and posterior tilt and the muscles that downwardly rotate and anterior tilt the scapula. The principles of the Integrative Movement System—alignment, breathing and control—provide a framework for restoring optimal alignment and control of the thoracopelvic cylinder and the scapula in relationship to the thorax. When you incorporate these principles into your client’s corrective exercise patterns such as the Modified Wall Plank and integrate them into the fundamental pushing and pulling patterns, you reinforce optimal alignment and control and ingrain more ideal motor control. Utilizing this approach, you are providing your client with a strategy for improving posture and movement. More importantly, you are providing them a strategy for successfully achieving their health and fitness goals with less restrictions. In Part II, I will discuss how to integrate upward rotation and posterior tilt into common functional pushing and pulling patterns. As a chiropractic physician Dr. Evan Osar provides a unique perspective on corrective exercise and fundamental training principles for the health and fitness professional that works with the pre and post-rehabilitation, pre and post-natal, baby boomer and senior populations. Dr. Osar has become known for taking challenging information and putting it into useable information the health and fitness professional can apply immediately with their clientele. He is the creator of over a dozen resources including the highly acclaimed Corrective Exercise Approach to Common Hip and Shoulder Dysfunction and has co-authored the recently released Functional Anatomy of the Pilates Core. He created the Integrative Corrective Exercise Instructor™ and Integrative Movement Specialist™ certifications to help health and fitness that work with the general population discover real-world strategies and solutions for improving posture and movement. For more information, please visit The Institute for Integrative Health and Fitness Education at www.IIHFE.com. Kolar, P, Kobesova, A., Holubcova, Z. 2009. Dynamic Neuromuscular Stabilization: A Developmental Kinesiology Approach. Rehabilitation Institute of Chicago – course handouts, Chicago, IL. Lee, LJ. 2013. Thoracic Ring Control: A Missing Link? In Touch Magazine, an official publication of the Musculoskeletal Physiotherapy Australia, a national group of the Australian Physiotherapy Association. Issue 4:13-16.